The Best Advice From Your Black Skin Care Specialist - Moisturize! When black skin is deprived of its natural moisture, an ashy or grayish appearance becomes evident. This is totally unappealing and can even have African American women rushing to hide their faces or (worse) lack self confidence. Therefore, moisturizing should not be ignored in your daily skin care regimen. As a matter of fact, beauty experts always point out that moisturizing is the secret to youthful, glowing skin. Most African Americans have oily skin because their sebaceous glands, which are responsible for your body's oil production, are bigger and more numerous than fairer skinned individuals. However, that is not to say that they don't need regular moisturizing. Moisturizing is necessary in black skin care and not just for people with dry skin. Those with normal skin should not skip this step, either. And while many people are aware of the importance of moisturizing, not everyone knows how to pick the right moisturizer or use one appropriately to maximize its benefits. Here are some Black skin care tips in moisturizing to guide you. The goal is to find a moisturizer that does not leave residue behind. A good moisturizer is easily absorbed by your skin and acts as a wall to prevent moisture from escaping. Cream-based moisturizers have a tendency to be greasy unless it is a water-based moisturizer. This will also work for you if you have sensitive or oily skin. 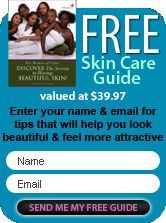 Also, choose an oil-free black skin care product for oily skin. This easily glides and is lighter on your skin. Go for non-comedogenic and hypo-allergenic brands to avoid clogged pores and the formation of whiteheads and blackheads. Another black skin care tip in moisturizing, is to use products with a milk base. It is a little less popular but just the same, it is very effective. For an extra moisture lift, look for milk in the ingredients, it might be referred to as lactic acid and it can protect your skin from pollution in the environment. The price of a moisturizer is not an indication that the product is good for your skin although it might say something about the quality of the ingredients. For those who ardently support organic products, look for reputable stores that sell organic moisturizers. Alternatively, you can make your own moisturizer with some natural ingredients. A moisturizer works best when applied after taking a bath. Your skin is still damp after a shower so it can seal in the moisture and maintain the effect for a longer period of time. There's no harm in applying a moisturizer more than once a day so re-apply if necessary. Supplement your Black skin care regimen with a moisturizing mask. Do it at least once a week to restore your skin's suppleness. A moisturizing mask hydrates your skin and smooths out fine lines caused by dryness. A moisturizer should be part of your African American skin care products stash but it is not the be-all, end-all of a well-moisturized skin. These black skin care products should be complemented with eating a balanced diet, exercising, and drinking lots of water. An average of eight glasses of water is recommended to keep yourself hydrated each day but if the weather is dry and hot, be sure to drink more. Also, shun excessive drinking of alcoholic beverages (if you cannot totally eliminate it). Coffee and tea are fine due to their antioxidant properties but they also dehydrate your skin, so you should add more water to your everyday consumption. Water is not only an inexpensive and effective moisturizer, it is also safe as it does not lead to clogged pores or aggravate acne or oiliness in your face. So the next time your Black skin care specialist suggest a great moisturizer to you, you might want to invest in your beautiful black skin..